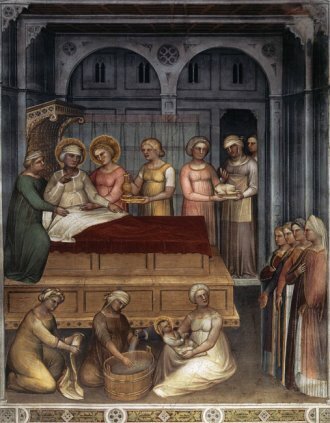 The rather involved tale of the birth of John appears in the first chapter of Luke. We are told that Zacharias and Elizabeth are a childless couple: both were ‘stricken in years’ and Elizabeth was barren. 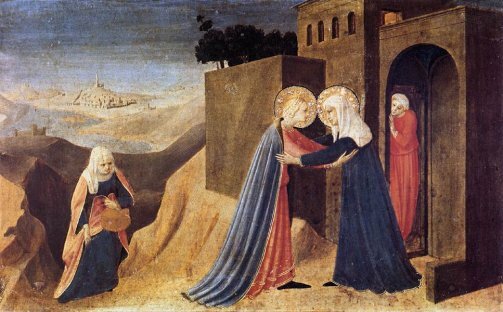 Zacharias, a priest, was officiating in the temple when an angel appeared and told him that Elizabeth would bear a son, to be called John. At this point Zacharias questioned what the angel had said, pointing out that he and Elizabeth were advanced in years and asking for proof. The angel told him that, because he doubted, he would be struck dumb until the events took place. Elizabeth conceives. 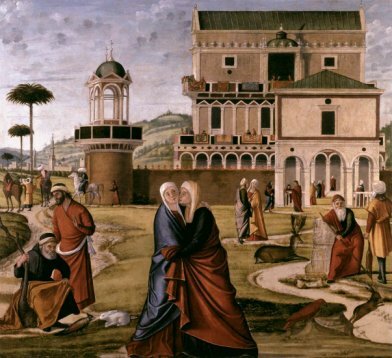 After six months, the Virgin Mary visits Elizabeth, the well known and frequently painted event called the Visitation. 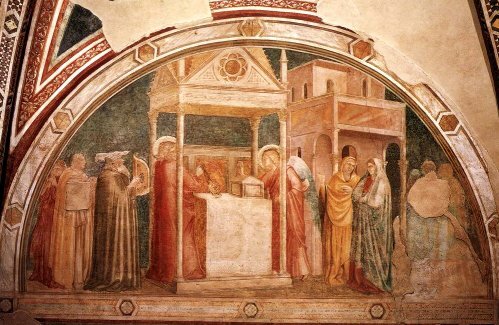 Luke tells us that the embryonic John 'leapt in the womb' at the presence of the unborn Christ. In due course John was born. 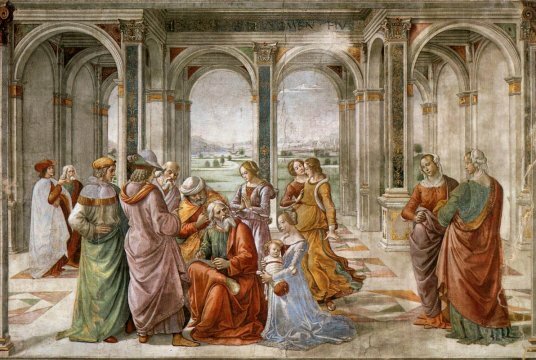 Eight days later he was circumcised: Zacharias wrote down his name, and was immediately able to speak. This narrative may well strike us as a familiar one. Here we have a ‘type-scene’ in which an angel announces a miraculous birth to an elderly or barren woman. 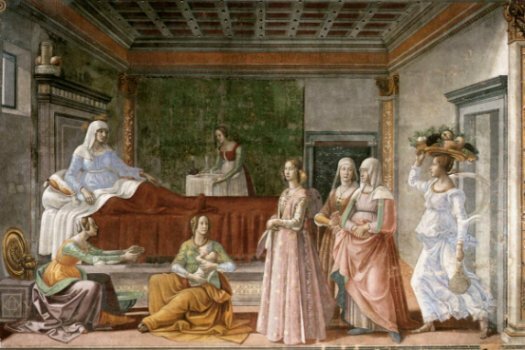 Miraculous births may or may not have historical validity, but they are a common theme in many traditions, marking the births of characters of significance. Examples in The Old Testament include the annunciation to Abraham, which I have written about in the section on angels, and the annunciation to Manoah, the mother of Samson. 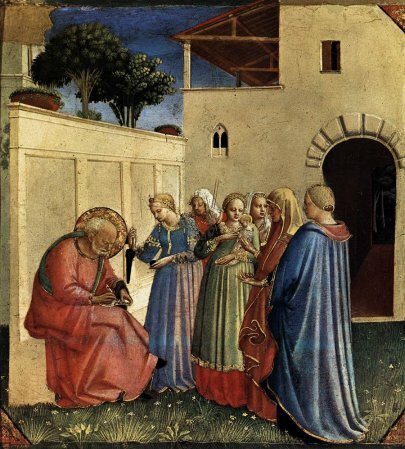 In the New Testament, the annunciation to Joachim, father of the Virgin Mary, has many similarities. The scholar J E Taylor considers that the story of John’s birth 'has been so heavily worked over by a Christian author that it is hard to claim any historical value at all'. * However, the basic facts - the place of birth, identified as Ein Karem, five miles west of Jerusalem, and the identity of his parents, may well be true. *John the Baptist within second Temple Judaism. 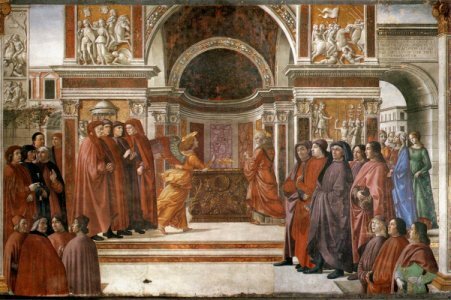 Domenico Ghirlandaio: Capello Tornabuoni, Santa Maria Novella, Florence.